Drew Adams is a transgender high school senior from Ponte Vedra, FL, who is committed to LGBTQ advocacy at the local and national levels. 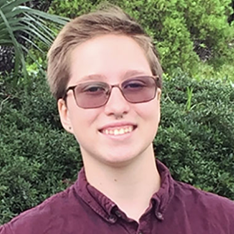 He serves as his high school GSA’s president and raises money for Northeast Florida’s LGBTQ youth outreach, JASMYN, to which he also donates food, toiletries and school supplies. Nationally, Drew serves as a youth ambassador and advocacy volunteer for The Trevor Project, a youth social media ambassador for the Matthew Shepard Foundation, and a Volunteer and Intern Coordinator for Point of Pride. On the legislative side, Drew lobbies for the Equality Act by visiting with his Congressional representatives and their staff. Additionally, Drew has spent years fighting to change his school district’s bathroom policy to be trans-inclusive, and the fight is still ongoing. Drew is an International Baccalaureate student and a volunteer at the Mayo Clinic, and he hopes to go to medical school and become an adolescent psychiatrist specializing in transgender health. For fun, he practices Brazilian Jiu-Jitsu, creates sculpture art and plays the piano.